From the moment that you depart on a private passenger ferry from the Indigo Plantation Marina in Southport, you will know that you are about to experience something special. The first thing that you will notice about Bald Head Island is the natural beauty that surrounds you. From the quiet unspoiled beaches to the maritime forests this is a truly exceptional place. Another thing that you will notice is the absence of gasoline powered vehicles. Transportation here consists of bicycles, electric golf carts and walking. Amenities and recreation on the island include a championship golf course, clubhouse facilities, a marina, croquet, tennis, swimming pools, restaurants, snack bars and relaxing on the beach or by the pool. The most famous landmark on the island is North Carolina’s oldest lighthouse. Built in 1817, Old Baldy has guided many ships safely into the mouth of the Cape Fear river for over 86 years. 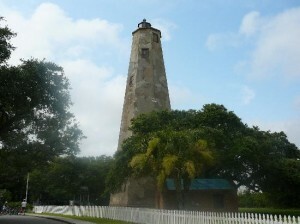 Old Baldy was retired from service in 1935 but has been restored and is open to the public for tours. Bald Head Island is tiny but has played a part in two American wars. During the American Revolution, it was home to Fort George, a British fort. During the Civil War, the same redoubts served as Fort Holmes, a Confederate base of importance to shipping and smuggling. Located at the tip of Cape Fear and residing at the convergence of the Cape Fear River and Atlantic Gulf Stream, the land mass of Bald Head Island ends, trailing off into thirty miles of treacherous sand bars known as Frying Pan Shoals. In this area, large sand bars seasonally emerge from and subsequently retreat into the sea.